Blackstar Squadron: Battlestar Galactica costuming group. 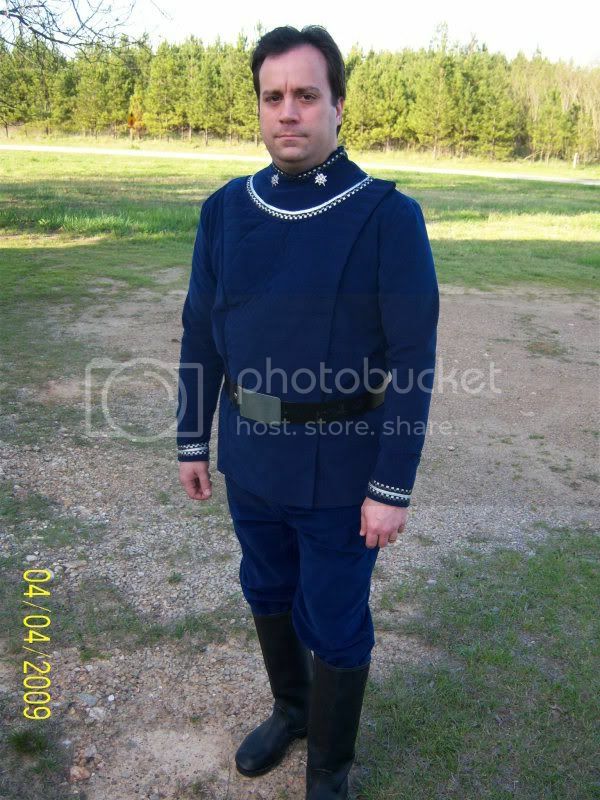 Re: Blackstar Squadron: Battlestar Galactica costuming group. Drop by the main forums for the Squadron! Nice. Does the end of it light up? Yes, the end lights up and it has a built in sound card that makes that classic blaster sound from the show. I got it a couple years ago from ebay... I haven't found another since. Cool that it makes the sound! Instead of spending waaaay too much for Ultrasuede, how about using microsuede? I've got a body pillow cover made of microsuede, and it's a smidge off of the color of the bridge uniforms, but could pass. I'm going to check around and see what kind of prices per yard are available. I've been checking out a couple of sites, and there's one called kjsinteriors.com that sells microsuede in gorgeous colors, for a very reasonable price per yard. Yeah, the fabric is intended for indoor furnishings, but why quibble? We don't want anything too light that has to be interfaced up the yin-yang, do we? They've got a range of brown shades from light to dark, and there's one there that's a chocolate brown that would do well for the Warrior's jacket. I also checked out prices for Ultrasuede and YIKES! They want $60 per yard! The stuff is pretty, but pricey. Here is Colonel Charybdis planetside, just to whet your appetites!! By the Lords Of Kobol, where did you originally get that uniform? And how many cubits did it cost you? I'll wager it must have been more cubits than I've had available to me in YAHRENS!! Hi guys! Nice to see my pic has been around!! I just checked and it is available for order right now for just $299.99USD. So what are you waiting for? I need help on the bridge!! Lords Of Kobol help us! Three hundred cubits and tribute! That IS more cubits than I have available to me in a whole yahren. Improved news, my fellow Colonials. I am able to duplicate our Core Command bridge officer uniforms without having to use the equipment aboard the Galactica.